S.Thomas’ College Mount Lavinia scored a thrashing 38 points (6 tries, 4 conversions) to 8 (1 try, 1 penalty) win over Maliyadewa College Kurunegala in their Singer Inter Schools ‘A’ Division league rugby tournament first round match played at S.Thomas College grounds in Mount Lavinia yesterday. Thomians led 12 points to 3 at half time. 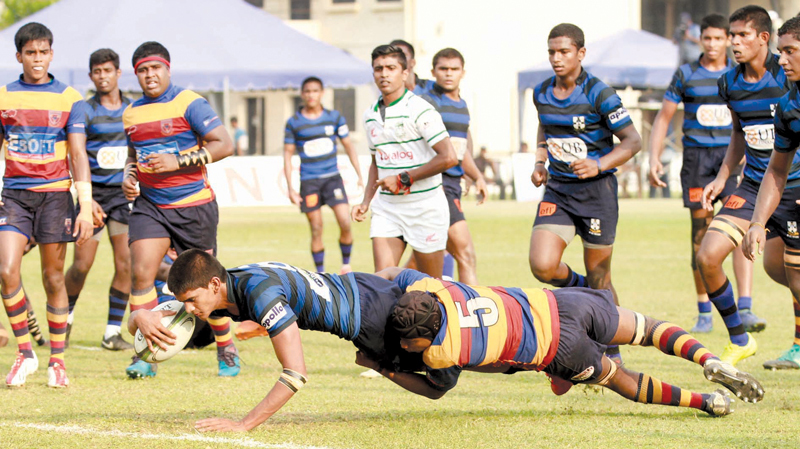 For the winning S. Thomas College team the six tries were scored by Kevin Jayasekar (two), Final Fernando (one), Hasintha Darmapriya (one), Navishka Karunaratne (one) and Aqib Cader (one) while the four conversions were slotted in by Jean Da Zoysa (three) and Ovin Hettiarachchi (one). For the losing Maliyadeva College their solitary try was scored by Sakun Sasanka with Kaushalya Gunaweera fired across the only penalty.